Although the 2,265 volcano-tectonic earthquakes at Planchon-Peteroa as reported yesterday by Georges Vitton (Le Chaudron de Vulcain) is perhaps the more interesting news, our readers are probably more interested in the large earthquake swarms in Tjörnes Fracture Zone. What is happening? Is it an eruption, is an eruption imminent or can an eruption be expected there soon? The IMO map for the TFZ today with the approximate outline of the fault lines added for clarity. The TFZ lies north of Iceland and is where the MAR, Mid-Atlantic Ridge splits in two to form a microplate between the Eurasian and North American plates. Those who follow the IMO Earthquake map will be very familiar with the outlines as indicated by numerous earthquakes over the years. The Global Volcanism Program defines it as “an oblique transform zone that separates the northern volcanic zone of Iceland from the Kolbeinsey Ridge”, but there are no known or identified volcanoes there. The GVP lists one submarine eruption immediately north of Manareyjar Island in 1867-1868. If there is an eruption in the TFZ, we should expect a submarine one but as the depth of water ranges between approximately 300 to 800 metres, there is little chance of one breaching the surface (like Surtsey did in1963) or even much being evident on the surface. So how do I find out what is or may be going on for myself? There are three things to check for immediately – tremor, drum plots and depths. First of all, go to the IMO heading “Tremor measurements”! Had it been an eruption, tremor would have risen instantaneously and in all three bands; red, green and blue, and by several thousands of units. Since both red and green have remained virtually unaffected, there is a very good chance that this is only a matter of tectonic readjustment. Now it is time to asses which type of earthquakes we are dealing with so let’s go to the drumplots (tromlurit in Icelandic)! 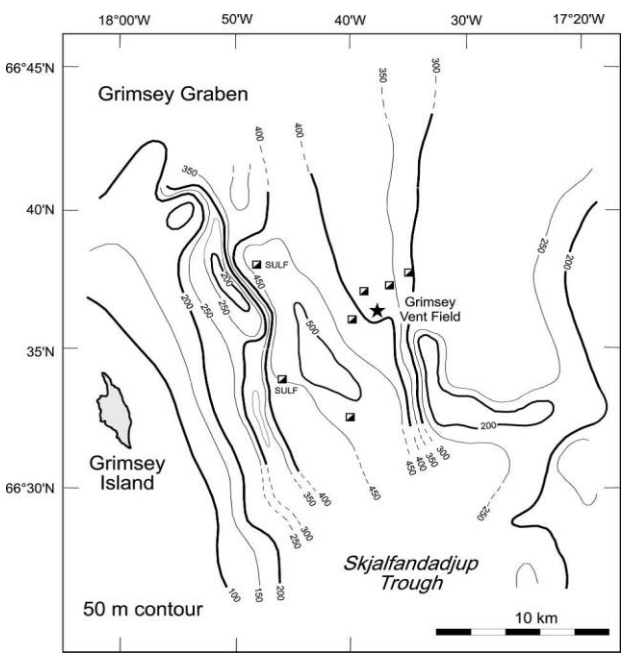 The IMO drum plot for Grimsey. The profiles are those of tectonic earthquakes with little or no hint of it being a question of anything else. Could this still be of interest to me as a volcanoholic with an unquenched thirst for eruptions or do I look elsewhere for my “fix”? Well, let’s check at what depths these earthquakes occurred! The IMO list reveals that the quakes centred at ~8 km NNW of Gjögurtá are at depths of between 8 and 13 km whereas the swarm ~13 km NE of Grimsey ranges between approximately 10 and 15 km. Now, let’s compare those with the known thickness of the crust at the two locations! At Gjögurtá, the thickness of the crust is approximately 25 km which places the current activity about mid-way through the crust, something that indicates that it is probably nothing more than tectonic readjustment. At Grimsey however, the thickness of the crust is no more than 15 km which places the activity right at the bottom of the crust where it meets the MOHO. IF, and it is of course a big if, it is an indication that the crust is splitting open right at the bottom, this could result in a huge fissure opening up. This in turn would lead to a dramatic lowering of pressure which can produce something known as “decompression melt”, i.e. the production of great amounts of eruptible magma. This is something to keep an eye on if the activity continues, grows progressively shallower and begins to show evidence of volcano-tectonic or magmatic earthquakes. Will there be an eruption? Well, earlier this year the crust split open in just this manner close to Eldey on the Reykjanes Ridge SW of Reykjanes (Reykjavik). For a short period of time, there was a 50-50 chance of an eruption but in the end, nothing came of it. For whatever it is worth, it is worth keeping an eye on future developments even if this activity is not out of the ordinary for the Tjörnes Fracture Zone. If the crust thickness map is any guide, Iceland looks something like a cone, with its point sticking down into the mantle, whose top is a bit lumpy and convex rather than flat. Elevations get up to what, a couple of km? Out of 45. 43 of those 45 must then represent the base-to-tip if the cone’s top were shaved flat. So it sticks down quite far. However I should point one thing. As far as it is known, the Tjornes region is a seismic transform zone, with plenty of tectonic events, often, and at times pretty large (up to M7.5) but rarely volcanic eruptions (although they do occur), and usually eruptions in the transform regions in Iceland are pretty rare and also small sized, so I would not expect , by any means, a large rifiting fissure event there. The same applies to South Iceland Seismic Zone, between Hengill and Hekla, where I lived for 4 years. The region, this one totally on land, shows evidence of eruptions every few thousand years and small sized, small efusive eruptions or sometimes explosive up to VEI2. But rather small. Volcanoes are also small sized. More than 99% of the energy is released by tectonic events, and because of the lateral slip movement, this leaves very little void space for the magma to intrude and erupt. Though research shows that magma intrusions do happen often, but erupt very rarely. Neverthless, the tectonic events feature as the largest in Iceland, up to M7.5. We could probably expect the same sort of behavior in Tjornes. And because the last tectonic event in Tjornes was back in the seventies, we should expect another large M6-7 event sometime in the next years or one or two decades or so. By contrast, there are regions in Iceland which are pure, pure rifting regions, with the plates moving exactly perpendicular to the angle of the tectonic fissures. This is especially evident at the dead zone between Katla-Hekla and Bardarbunga-Grimsvotn, also at the rifting region (also apparently “dead” but just so) north of Hengill until Langjokull, and most of the region north of Bardarbunga. These regions very rarely have earthquakes and eruptions are frequent but not too much (in the order of once every century or two). When they do occur, they result in long large fissure with incredible volumes of magma erupting over very long rifting intrusions. Until 2014, this was just unobserved theory, but then we just saw it developing real-time. The thing is that north of Bardarbunga eruptions occur more in form of monogenic shield volcanoes and less of fissures, while near Laki, Edlgja and Veidivotn they form our famous record long fissures. I also have a feeling, considering that Tjornes is a microplate, that eventually in the geological future, it will become like Hreppar, and emerge from the ocean and become a land feature. Parts of Hreppar were under the water, as recently as 10.000 years ago, but sediment from the rivers and lavas from flood basalts like Bardarbunga enlarged the coast and made Hreppar become land. But there is evidence of even Surtsey eruptions along the fracture region. This could also occur at Tjornes. Especially as lavas from the flood basalts from north of Vatnajokull reach the coast and enlarge it, further north. Also glacial floods will contribute to the enlargement of the coast. Very good points, Irpsit! On observation though, what of the Krafla fires of the 1980s? Hi Henrik, I haven´t understood exactly what you meant to ask. Krafla was a rifting eruption, albeit a small one, over a period of a decade spread along several small eruptions. I think in the end, the sume of all those eruptions along that decade was under 0.6 km3. Krafla had another rifting series back in 1720s and those were of a larger volume, perhaps near 1km3. Krafla is located still in a rifting region, that is between Þeistareykjarbunga and Bardarbunga. There are many shield volcanoes in this region that produced well above 10km3. North of Þeistareykjarbunga the rifting region ends and the Tjornes fracture region begins. Henrik, I have the opinion that recently the north volcanic region in Iceland is becoming more active (in Iceland regions become more active or less active over cycles lasting a few centuries). Krafla had the two rifting series of 1720s and 1980s, Askja began a series of eruption after 1875 large eruption, and now Holuhraun with its eruption. I think this entire region was mostly quiet in the centuries before. If this trend is correct, then I would expect more major eruptions north of Askja in the next decades or few centuries. I wanted to comment on other topics in previous post but I will do it here. The reasoning behind the current uplifting of Bardar taking about a century, due to their M4 quakes is quite interesting. Makes sense. The 8 green stars in the map today. Not a worry. The stars at Bardar unrelated to events in Tjornes. But perhaps the stars in the south part of Tjornes could be connected to the stars in the north part, and point to some widespread readjustments happening at Tjornes microplate. And regarding the article of IM on Bardar caldera collapse, i just saw wow…. in the end i was amazed that it was really 1.5km3 of magma erupted at Holuhraun. Quite a massive eruption, though of 10 times less than Laki or Veidivotn. But also let´s remember that Katla erupted slightly more than this, in ash, back in 1755. Or Oraefajokull did several times more than that, in a single huge blow back in 1362! Not to split hairs, but isn’t “caldera collapse” redundant? Maybe it is an Icelandic-to-English translation thing, or maybe it is just me (more likely the latter…. ), but wouldn’t “edifice or summit collapse” be a better term and a more accurate description of the processes in play here? A caldera is formed when the roof or edifice or summit or region collapses to form a bowl-shaped depression or cauldron. A caldera collapsing would just become a deeper or nested caldera, right? Geological versus human time-scales possibly? Not redundant. This caldera of Bardarbunga was already there before the eruption. It was some 600 meters deep and it just got some 70 meters deeper. In every daily M5, the entire caldera would sink a further 0.5m in a sudden movement. It was an epic remarkable event for all of us living in Iceland, feeling those M5s at times and seeing the caldera sink further. It did not made a nested caldera. It just sink the previous and only existent caldera, along its ring-faulting. I suspect most calderas in Iceland are really derived from rifting and escape of very large volumes of magma towards the lateral intrusions into rifting eruptions, rather than violent eruptions. But sometimes, during those collapse, things still go violent (as in 1875 in Askja). In Askja, first a large rifting eruption began and the caldera began sinking. Some time later, magma mixed and a violent eruption resulted. I suspect that Katla caldera is result of magma drainage into lateral eruptions like Edlgja, as well as Bardarbunga caldera sinks as a result of eruptions like Veidivotn and Holuhraun. Grimsvotn could have a caldera sinking as a result of Laki, but also forming as a result of some violent early Holocene VEI6 eruptions. Crust depths of 30km to 45km are looking like continental crust, rather than oceanic crust? All that seems to be missing is an active subduction zone? Any andesitic lavas? From my recollection Icelandic volcanism tends to be bimodal. Dominated of course by compositions that are basalts or basaltic andesites – but with occasional occurrence of much more evolved rhyolitic material – generally associated with the periphery of magma chambers – at places like Krafla and Landmannalaugar. I’m not aware of any significant occurrence of intermediate andesites or dacites. Weren’t there compositional hints that some portion of the magma erupted by Hekla contained subduction products? Yeah, there were. Looks like *nothing* is missing, KarenZ! Not sure where the stuff came from though. Perhaps Hreppar ate another microplate geologically-recently? Eyjafjnallajokull also had some andesitic lavas. Oraefajokull could have some more evolved magmas and also be part of some less understood tectonic setting. Crust is very thick there and some portion of continental crust could be melting. Oraefajokull has trachyte and trachydacite as minor rock types, according to GVP. Continental fragments can easily be formed when a super continent breaks apart by rifting. Between Iceland and Ireland there is another continental fragment, the Rockall Plateau. Regardless of any continental crusts, crusts directly underneath MAR are always much thicker. Oceanic crust starts thick and thins as it moves away from the rift. Underneath Iceland, it also needs to be thicker anyway in order to push up Iceland above sea level. It is like an iceberg: to get it higher above the water you need to add more under water. Iceland is several kilometer higher than a typical MAR. That requires thicker crust. That is a very good analogy as the differences in density are similar. Continental crust is silica-rich, something that lowers the density as compared with the mantle or indeed oceanic crust. Thanks Henrik. The waters may look calm but far below you never know what can be happening. Thanks to IMO & those here at VC we can wait & see. Thank you for an interesting feature, Henrik! Thanks for finding and posting this image, Bjarki! Its certainly possible that an eruption could take place there, though we know little about the underwater terrain. Having no tremor makes me discard the possibility of an ongoing eruption. Also in transform seismic regions in Iceland, eruptions are possible but more rare. The TFZ faults can produce large earthquakes. 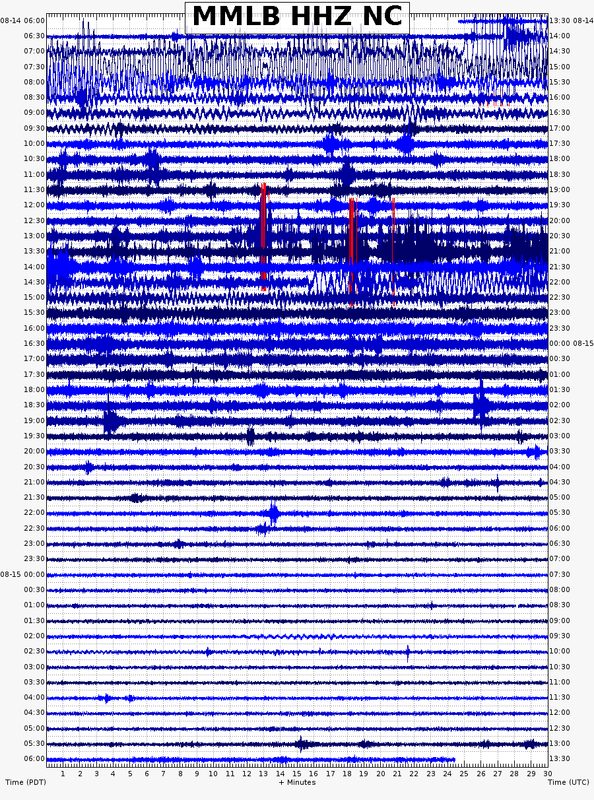 Any chance that the current eq swarms are foreshocks? Always possible… but it’s equally possible that they were the main event. Like Lurk said, can be both. But eventually these M3s are the release of a tiny percentage of a large tension stored, due to be released eventually in a large M6-7 quake. We have little data concerning Tjornes major quakes. I searched the internet for it, but I think there are better records in Iceland itself. In the SISZ where tectonics is similar, the released is quite predictable, so when in the year 2000, nearly 80 years have past since the last M6-7 quake, it was quite predictable that a large quake (usually they come in a series) woudl come in soon. And it did, in June 2000, as a couple, as predicted and in two different locations. The IMO did quite a hit in their prediction a few months before, both of timing, magnitude and location. It was impressive. I think there were also some foreshocks. In 2008 another couple of M6 quakes struck, and further west, and the tension has been mostly released, but there is still space for another M6 quake. Either near Hengill, or near Hekla. In Tjornes last quake was in the seventies, at same time as the Krafla events further south and certainly connected to it, and now there is tension to a large quake in some locations which have not seen a quake (M7) in more than a century. Back in 2014 I remember the IMO issued a warning of a pending large quake, during a seismic crisis in Tjornes. Basically all across Iceland, from Reykjanes to Tjornes, tension is released in either eruptions in rifting areas or as a large quakes in transform zones. Each region has a particular set of behavior, which makes them quite predictable. For instance, rifting the the dead zone takes place nearly every 200-300 years as tension for 10 meters of rifting is stored. This makes a rifting event in the dead zone likely this century or next. Is there a significant ongoing eruption at Etna? I follow often SAT24 satellite of Europe and now it shows an area of thunderstorm persistent in Etna location, with clear skies all around. Could be just a coincidence of a thunder there, but just asking as can´t find any information on it. Its early morning not the most likely time for a thunderstorm. Yes I just confirmed its ongoing. Plume must be high to be detected in SAT24. It could be well a VEI4 eruption, and if so, then it would be the largest eruption in Etna for a long while. If not, its still quite a large eruption, perhaps since a few decades. Etna did a VEI3 in 2002 and in the nineties too. And a VEI4 some centuries ago, and also a devastating VEI5 some 2000 years ago (with a tsunami across the Med sea due to a flank collapse). So its a volcano to pay attention too, especially having the potencial to affect many people. It’s only my speculation, but I would suspect that Etna’s event was probably VEI2-3. Remember, VEI 4 events, ten times the size of VEI 3, only happen about once a year on average, worldwide. If Etna had produced a VEI 4, you might think it would cause a stir in the media (it might yet, of course) since there hasn’t been one that size since 1787 (GVP). The fact it seems to have been all over in a few hours suggests another of Etna’s frequent ‘paroxysms’ -spectacular, but the total volume probably not that great. Where’s Boris Behncke when we need him? It could be that the ash released from Etna just mixed with some local convection and caused a local early morning thunderstorm yesterday and it was just a coincidence what was seen at SAT24. Otherwise I think we had at least a VEI3 but the intensity of eruption although short lived could have been compared to a VEI4 eruption, with a column rising to at least 10km high, though the total volume of ash released was less than 0.1km3. I start to think it was just a local thunderstorm, otherwise the media would have picked. Thunderstorms are common in Europe, especially at this time of the year and can occur any time in the day. No strong eruption was reported. There was a bit of thunderstorm activity around in southern Italy, not too much but it seems the atmosphere was a bit unstable. I wonder whether a comparatively small amount of ash could have triggered a significant amount of cloud formation under these conditions. There might (or might not) come some weird tremors, on one or the other sensitive sensor, from an unusual corner one of these days. Parts of the mountain Mannen in Norway, has these last couple of days moved about 10 cm every 24 hours, (movement seems to have stopped atm) average normal movement is 1-2cm pr year, there’s an estimated 100,000,000cubic/m of rock which is predicted to go crashing down. I remember this, I think Carl posted a webcam for it probably back in Oct ’14 (if it’s the same one). Had always wondered whether it had given way but still seems to be holding on. Not sure if anyone still has the link, had a quick look but couldn’t find it. Here’s a link to a static shot of the ‘incident’ I’m curious about. Sorry about the rolling image above. I keep forgetting that image links are dynamic here. I’m not going to guess, but if you ask Carl, he would probably say it’s hydrothermal. The depth of the M7,2 has been revised to 10km. I am surprised by how shallow it was. Here is a Tumblr post on a website I stumbled across. Believe it is March 12th St. Helens eruption. My encounter was a month later.. This was taken by the fellow’s grandpa..